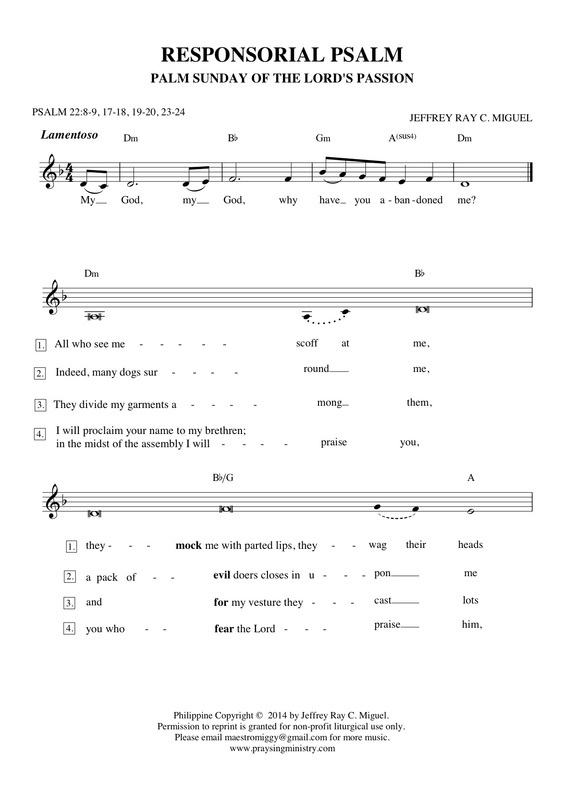 Have you found a setting for the New Roman Missal already or are you ready to change your setting after singing the same one for several seasons? 1. It is written primarily with the congregation in mind. Thus, the capabilities and vocal range of the congregation were emphasized in composing the music to enhance their ability and desire to participate in singing their praises to God. Choir and piano parts only exist to complement the people’s melodic line. 2. Sung dialogues between Presider and Congregation were written to promote the active participation of the congregation in the mass. The musical responses of the congregation were deliberately composed to create familiarity as an aid to learning the revised text. 3. There is a recurring melodic motif. 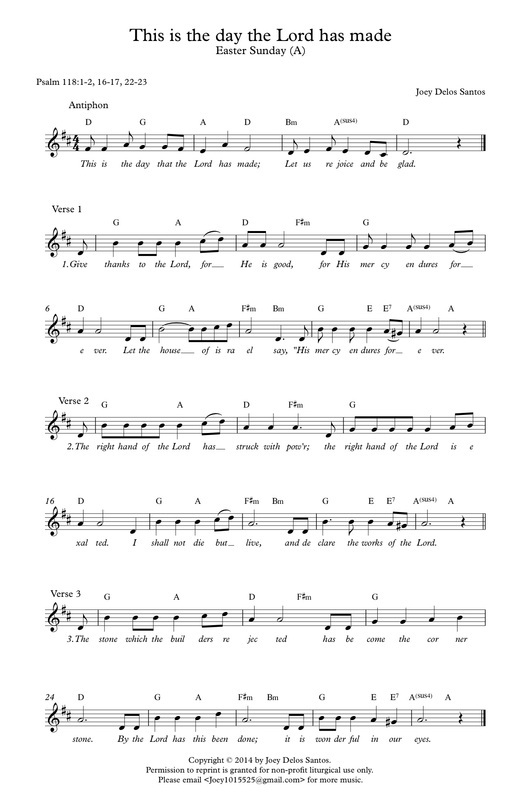 Repeated melodic lines heard and sung throughout the mass are intended to aid in the ease of congregational singing. 4. It is faithful to the liturgical text of the Revised Roman Missal. The text is intact rather than re-written to fit the melodic ideas. Thus, no lines or phrases are unnecessarily repeated. This will aid the congregation in adjusting to the new text without confusion. You may view the Gaudium Mass playlist here. Learn more about the Gaudium Mass or download the pieces (simple melody only) by visiting this page. Our composition in English is by Tinnah M. dela Rosa. Please click the pictures or the highlighted link to download the high resolution PDF files of Tinnah. Click the highlighted link to view the readings in English for next Sunday (May 4, 2014) via the US Conference for Catholic Bishops website. Christmas or Easter? As Christians, what is more important to us? We should commemorate the Lord’s birth because if not for His becoming man like us, there would be no salvation. But, did we already win salvation when Christ was born? He was just a mere baby, then. We waited, patiently waited, for Him to grow, about three decades or so, before we attained the much-awaited salvation through his passion and death on the cross. It was eternal life that God promised us, as stated in the very words of St. Francis of Asissi: "It is in dying that we are born to eternal life." Angels appeared both in his birth and resurrection, to proclaim God’s faithfulness in His promise to mankind. What a great and mighty God we have! Either way, we should remember this: Without Christmas, there would be no Easter—and without Easter, Christmas wouldn’t matter (a quote from Billy Graham). As you pray with this contemporary Christian music by Matt Maher, entitled Christ is Risen, let us recall and be reminded of Christ’s passion, death, and resurrection. 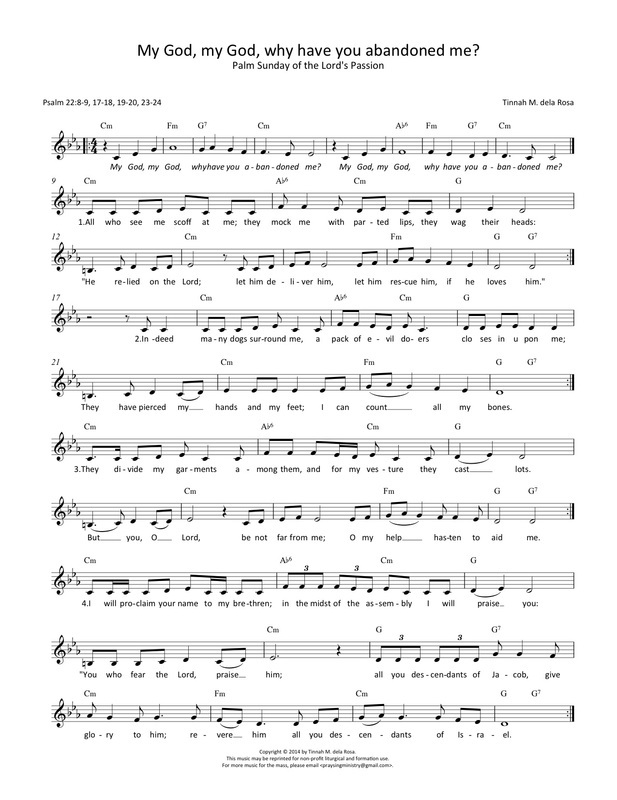 Celebrate Christ’s resurrection through the powerful words of the song. Pray and thank the Lord our God for His faithfulness to us. We have just concluded another Lenten Season. How has it been to you? Is it the same old thing, or do you carry a renewed spirit every year the season passes? May we never tire of commemorating this wonderful Paschal Mystery. Thank you to BeingStudios for the video and Em Alcantara for the reflection! Happy Easter! This Easter Season, PraySing Ministry shares a video of the Gaudium Alleluia by Tinnah M. dela Rosa, a song from the Gaudium Mass CD produced by PraySing Ministry. The Gaudium Mass is one of the 5 Best Inspirational CD finalists in the 35th Catholic Mass Media Awards. You may find the simple melody on this page.The Gaudium Alleluia is one of the 43 pieces in the Songbook and 29 tracks in the CD. You may buy a copy of the Gaudium Mass from any of these stores. Please click the pictures or the highlighted link to download the high resolution PDF files of Tinnah. Click the highlighted link to view the readings in English for next Sunday (April 27, 2014) via the US Conference for Catholic Bishops website. Where do you see God? How do you remember him? Do you find Him in nature, as the wind blows on a hot summer day or in the warmth of the sun or maybe in coolness of the rain that gently drops on your face? Do you see Him in people you meet each day, in the various events in your life or in your feelings and actions? As St. Ignatius of Loyola has taught us, you are invited “to find God in all things.” As you pray on this Holy Thursday, go out on pilgrimages, attend Mass, or celebrate with your loved ones, ask yourself: "where do you find God and how do you remember Him?" On Holy Thursday, we remember and celebrate the Last Supper wherein Christ instituted the Eucharist, which is the heart and summit of our Church life. We also remember Jesus washing the feet of His disciples that clearly shows the humility of Jesus and taught us how we ought to serve others just as He lovingly and generously did. Try to look into the small details of this day or the bigger picture it offers and with God’s grace, you will find God or He may find and call you. If it helps you may also reflect and pray with this beautiful poem, “Do This in Remembrance of Me” by Neale Walsch (background music by Jim Chappell). May you embody and live out Christ’s love, humility and service on this Holy Thursday and everyday! Many thanks to MerhlinsPlace for the video and Delson Balance for this reflection! As we reflect on the Passion, Death, and Resurrection of our Lord this week, we wish to share this 2-page setting for Eucharistic Prayer II composed by Tinnah M. dela Rosa. This fits very well the motif of the Preface Dialogue, Holy, Memorial Acclamation, Doxology and Great Amen settings that may be found in the Gaudium Mass, also composed by Tinnah for the New Roman Missal. The Eucharistic Prayer or Canon of the Mass is the central prayer of the entire celebration. Most Catholics have been made aware from their earliest days that during the Eucharistic Prayer the bread and wine are transformed into the Body and Blood of Christ. What many Catholics are not aware of, however, is that the Eucharistic Prayer is about more than adoring Christ who becomes present in our midst. The Church tells us that liturgy (and the Mass is the highpoint and heart of liturgy) is the action of Christ the priest and His Body, the Church. In the celebration of Mass, during the Eucharistic Prayer, not only does Christ become present, body and blood, soul and divinity, under the forms of bread and wine, but Christ's saving action, His passion, death and resurrection are once again enacted and offered to the Father by Christ Himself in the person of the priest, and by all present. This is a truth of enormous significance!. This action of Christ which brought about our redemption from sin and eternal death, offered once for all on Calvary, becomes present again for us, here and now, in this time and place, so that we can join in Christ's perfect offering and can ourselves participate in His perfect worship. To download the full 2-page setting, please click the picture above or this link. Read more about the Eucharistic Prayer via the United States Conference of Catholic Bishops page. 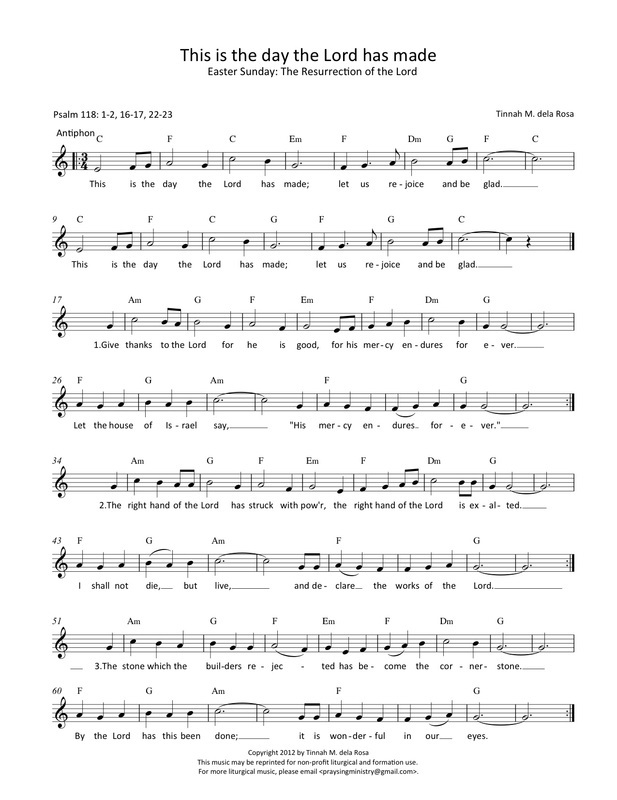 We are so blessed this day because we have three psalm settings to share for Easter Sunday. The psalm setting in Filipino is by Marc Misael S. Gamil, and the two settings in English are by Tinnah M. dela Rosa and our new contributor Joey Delos Santos. Joey is a twenty-one year-old graduate of Hotel and Restaurant Services who hails from Bacolod City, Negros Occidental. He has been a youth leader at his parish for the past 8 years and is now the Youth Choir Director at St. John Nepomucene Parish. Please click the pictures or the highlighted link to download the high resolution PDF files of our composers. Click the highlighted link to view the readings in English for next Sunday (April 20, 2014) via the US Conference for Catholic Bishops website or the readings in Filipino via the Word and Life Publications. Who among you has hurt or betrayed someone and yet was treated with forgiveness and love in spite of it? How did that make you feel? As you pray with the song, "As I Have Done for You" by Dan Schutte, pause for a moment to recall the times when you have been treated with love in spite of the pain or hurt you may have caused another. Pray in thanksgiving for this experience of being loved despite the wrong you may have done. Then recall what the Lord has done during the last supper. Ask the Lord for the grace to help you do the same - that you may also learn to love as he has loved. At the last supper, Jesus experienced the pain of betrayal and yet he continued to love his disciples to the end. His love was so great that he sat at table even with the one who would betray him. Jesus modeled for us a love so other-centered and so complete that it overlooks the weakness of others and instead draws out the good in them. We are able to love those who wrong us because Jesus has given us the perfect example of how to do so. We are to love others by serving them and being reconciled with them. May your heart be open to imitate the example of Christ by loving and serving others, even those who have hurt us. Have a blessed Thursday! Many thanks to Janet America Flores for the video! Click here to view the readings for next Sunday (April 19, 2014) via the US Conference for Catholic Bishops website. We are so blessed this day because we have three psalm settings to share for the Palm Sunday of the Lord's Passion. Our two compositions in English are by Tinnah M. dela Rosa and Jeffrey Ray 'Migs' C. Miguel, while the composition in Filipino is by Dennis N. Marasigan. Please click the pictures or the highlighted link to download the high resolution PDF files of our composers. Click the highlighted link to view the readings in English for next Sunday (April 13, 2014) via the US Conference for Catholic Bishops website or the readings in Filipino via the Word and Life Publications. What is it that you want most in your life? What is it that you yearn and long for with such fervor and passion? Is your prayer to the Lord marked by seeking what God can give you? If your Christian life is marked primarily by asking God for things, then you might be more in love with the gifts of God rather than God who is the giver of these gifts. Take time to reflect on your relationship with the Lord and ask yourself, "How much do you desire to know the Lord and to follow his ways?" If it helps, you may pray with the song, 'Only This I Want,' by Dan Schutte to help you reflect. Speak to God and ask him to teach you to seek him and not just his gifts. This Lent, we are challenged to go beyond simply seeking and receiving God's gifts. We are invited to know the Lord, to be in a much closer relationship with him, and to follow his example - for to do so is to gain all that we need. May you 'gain the Lord' this Thursday and everyday! Many thanks to Maureen Ward for the video! Our Tuesday PraySing post is a responsorial psalm for Good Friday by Tinnah M. dela Rosa. Please click the picture or the highlighted link to download the high resolution PDF file of Tinnah. Click the highlighted link to view the readings in English for Good Friday (April 18, 2014) via the US Conference for Catholic Bishops website.